Systemax Inc., a leading multi-channel retailer of computers, electronics, and industrial products, has purchased the Circuit City brand, trademark, website and other assets. They’ve recently launched the all-new CircuitCity.com website, which offers values on a huge inventory of brand name computer & electronics products, at what they claim are the most affordable prices in the industry. Hopefully this won’t be the same “affordable prices” that Circuit City offered its customers during its going-out-of-business sale. Although most items were 40-50% off, this was based on hyper-inflated retail prices, which meant that Circuit City’s sale prices were often higher than what you could find at Best Buy or Amazon.com. I was able to find a few good deals at the time, but most items were picked-over expensive crap with no return policy. 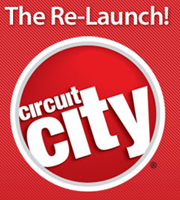 The new CircuitCity.com features low everyday prices, world-class 24/7 customer service (because they haven’t fired their experienced staff yet, as did the old Circuit City), and a wide selection of products. You’ll also enjoy advanced search capabilities and enhanced content, which includes photo galleries and videos of thousands of the most popular consumer electronics and computer products & accessories. I have a Systemax box that I use for video editing a couple years ago. I bought it because the price seemed pretty good, but they also boasted that all its technical support is based here in American. I cannot verify that because I haven’t had a single problem with it~! And I’d rather shop at Circuit City than Best Buy any day!!! The new site is a direct copy of TigerDirect.com (same company now?). Same inventory, same e-commerce layout.